The usual French term for traffic—meaning the movement of motor vehicles—is la circulation. The word trafic can be a synonym for it, but its primary meaning is traffic in the sense of commerce, the exchange of goods. Jacques Tati’s use of the word for his 1971 panorama of car culture is pointed: it is an example of the same ironic franglais he used in calling his previous film Playtime. Linguistic cosmopolitanism in the Babel-like world of commerce and culture is one of Trafic’s several satirical targets. Trafic is primarily a film about cars and their effect on the people who drive them, buy and sell them, and occasionally have to jump out of their way. At the time of its release, Tati insisted, in the French publication Show Business (another franglais title), that he was no more opposed to cars than he had been to modern architecture in Playtime: “I’m simply trying to show that individuals change when they’re behind the wheel of a car.” In addition to the drivers themselves, Trafic is concerned, quite literally, with the movement of goods. Here, the director’s perennial alter ego, Monsieur Hulot, is the designer of an innovative camping car manufactured by the fictional French motor company Altra (in reality, the car is an embellished Renault 4L). The vehicle is to be unveiled at a motor show at Amsterdam’s RAI exhibition center, and Hulot undertakes to transport his creation there, accompanied by truck driver Marcel (Marcel Franval) and an American public relations officer, Maria (Maria Kimberly). The film’s founding joke is that the vehicle can’t make its own way to Amsterdam and must be carried—and for all its supposed organizational wherewithal, Altra is unable to find any better transport for it than in the back of an antiquated lorry that constantly breaks down. Tati’s story of failed transportation might be seen as a parodic variation on Henri-Georges Clouzot’s The Wages of Fear (1953), about the moving of a cargo of explosives—except that in Trafic the world itself, rather than the cargo, is explosive. Hulot’s journey is fragmented by endless stops and detours. His inability to follow a straight line is signaled before he even leaves the Altra HQ: whenever he tries to draw a frame around his design, someone enters his studio, nudging him and turning his line into a zigzag. Yet Hulot himself is rarely the cause of the chaos. The most decisive catalyst of disaster is Maria, whose obsessively linear fixation on bypassing all obstacles to reach her goal is what most slows down the journey. Her insistence on driving unceremoniously through a border control gets the lorry impounded by the Dutch police, who inspect its contents in detail. This sparks an extended interlude in which Hulot demonstrates every fanciful, yet perfectly rational, feature of the van: seats that unfold from the bumpers, a grill that can actually cook a steak, a horn that sprouts an electric razor. Later Maria, speeding past a traffic cop, triggers a spectacular—though unusually benign—pileup, one of the film’s few intricately choreographed routines, involving a Citroën skating forward at a 45-degree tilt, a car spinning on its axis, and another chasing a runaway wheel, bonnet opening and closing so that it resembles a hungry crocodile. A new kind of movement emerges from the stasis established by the crash: the motorists leave their vehicles to stretch in a curious ballet, a priest tends to his car, kneeling at the hood as if conducting Mass. In Tati’s motorized world, the one impossibility is meaningful motion. The final tableau of Playtime choreographed the movement of cars around a traffic island to resemble a fairground roundabout: literally “circulation,” but in its most joyously poetic form. In Trafic, by contrast, we repeatedly see cars careening noisily around motorway systems, yet the condition to which they ultimately tend is gridlock. Cars judder bumper to bumper, unable to advance more than a few inches at a time. Montages show bored drivers sitting at their wheels, picking their noses. Travelers who stop at gas stations get laden with large mock-classical busts, free gifts from a petrol company—a culture of motion and modernity freighting down its customers with heavy, futile tokens of antiquity. The film’s most elegant joke about speed and modernity follows a scene in which characters watch TV coverage of astronauts on the moon: the next morning, Marcel and a Dutch garagist play at moving slowly as if in zero gravity. It’s one thing to reach the moon; getting to Amsterdam is a little harder. At stake in all this is communication, in the dual senses of travel and language. Echoing Playtime, the film’s dialogue is a polyphony of languages—here French, Dutch, Flemish, and English. Or rather, at least these four, since English is spoken in several variants: American, Dutch, and (haltingly by Hulot) French. And this is only counting human sounds: the roar of motors, screech of brakes, and clatter of car doors is no less autonomous and meaningful a language than those of words. The overall difficulty of communication was reflected in the film’s making. After the financially disastrous production of his extravagantly complex Playtime, Tati was forced to find more economical working methods, and Trafic began as a French-Dutch coproduction, to be directed jointly by Tati and Dutch filmmaker Bert Haanstra. Haanstra began the film and shot the montages of the drivers, together with the early sequence in which people step over invisible wires in the empty RAI hall (this was filmed in a hangar at Schiphol airport, although the later RAI scenes use the actual car show). As Tati’s biographer David Bellos recounts, Haanstra left the project early, frustrated with his collaborator’s insistent unavailability. The film was completed despite funds running out, with Tati getting last-minute help from a Swedish crew that was shooting a documentary about the production; one member was the future director Lasse Hallström, who shot several takes, though none of them were used because Tati fell out with him. Trafic was partly improvised on the basis of Tati’s six-page outline and a series of specially commissioned cartoons; this process is reflected in the seemingly casual nature of the film’s narrative. Literally and figuratively about breakdown, Trafic could be seen as a story of lost control, both Hulot’s and Tati’s. Having reduced Hulot to merely one figure amid Playtime’s multitudes, Tati was reluctant to use him again as a central protagonist, but was obliged to in order to get funding. Hulot’s role here is different than in the earlier films: he is neither the cause of chaos, as in M. Hulot’s Holiday, nor a bemused observer of modernity, himself belonging to a saner world, as in Playtime and Mon oncle. Implicated as much as anyone else in the automobile universe, Hulot is himself the designer of a futile lifestyle product. In Trafic, Hulot does not question the world he moves in; rather, we sense him standing apart, shrugging, effectively powerless. He has become an exile on life’s roadside, instead of the befuddled but active explorer of Playtime’s futuristic urban jungle. Ruined financially after Playtime’s visionary extravagance, Tati seems in Trafic to wash his hands of the city and its follies: Hulot’s camping car at last comes into its own at a Dutch garage, where he and his companions enjoy a riverside picnic, having apparently lost all interest in reaching Amsterdam. Tati certainly appears less in control than in the vast coordinated ballet of Playtime. For the most part, the jokes in Trafic drum up a sense of languid, almost apathetic chaos (note the distracted workers at the Altra workshop), without there always being conventional payoffs to give the comic business a sense of purpose. Notwithstanding the painstakingly synchronized pileup scene, the film is characterized by slow-burn gags that create an overall comic atmosphere rather than work toward a clearly defined goal. There is a sexual broadness for the first time in Tati’s films: a woman’s sumptuous cleavage turns out to be a baby’s bottom. There is even a certain elaborate meanness. Tati sets up a laboriously unfunny gag in which a group of young pranksters swap an afghan coat for Maria’s dog, making her think her pet has been run over. The gag only properly pays off, in even crueler fashion, when Hulot, attempting to unmask the prank, upsets Maria even further by stamping on the “dog” and pulling off its nose, actually a button. Without a doubt, Trafic contains a hovering tone of despair that makes it a somewhat melancholic pendant to Playtime. Where that film asserted hedonistic disorder in the face of the city’s dehumanizing linearity, Trafic acknowledges the triumph of the inhuman and inert. A hecatomb-like mountain of junked vehicles warns us that—despite the motor show’s rhetoric of automotive optimism—car culture tends irrevocably toward death and inertia (it’s worth remembering that Trafic was made only four years after Godard’s Weekend, with its unforgiving motor apocalypse). Trafic’s ending is strikingly ambivalent. On a positive note, there is triumph in defeat. Hulot’s party reaches RAI too late: the show is already closed, and he is summarily fired. Nevertheless, the camper car, parked outside, is a hit, drawing a fascinated crowd. Maria, too, has been progressively humanized by the trip, turning from the robotically helmeted machine woman who left Paris into a laughing, jeans-wearing free spirit who seems barely troubled by the failure of her mission. As Hulot and Maria part, he dives into a subway entrance, only to be carried back toward her by a surging crowd. The two walk off together under his umbrella. It’s a happy ending for them, but not for the world: the final images are of a vast car park, or traffic jam, with pedestrians reduced to black umbrellas weaving through its narrow junctions. The cars themselves have usurped the gridded city of Playtime. Trafic is generally held to be one of Tati’s minor films, and he himself saw it as a step back after the accomplished vision of Playtime. It’s certainly true that Trafic is not consistently funny, its humor drawn out or diffuse to the point of near abstraction. Its real comedy lies less in jokes than in the accumulation of polyphony and simultaneous incident, and in the offhand touches that serve as punctuation. Most interesting to Tati here is the creation of a world universally infused with comic tone. In its deceptively disorganized looseness, Trafic tends toward a comedy without jokes: Tati has moved in the direction of a seemingly unorchestrated form of rarefied humor in which it’s primarily the viewer’s job to find things funny—just as we might find the world itself funny—rather than let ourselves be passively entertained by something signposted as inherently amusing. There are numerous post-Tati examples of this form of humor: the later comedies of Luc Moullet, Aki Kaurismäki’s sad-sack tragicomedies (notably Take Care of Your Scarf, Tatjana), Otar Iosseliani’s tapestries of human folly, the Strindbergian slapstick of Sweden’s Roy Andersson (Songs from the Second Floor; You, the Living). A recent example, utterly Tatiesque in its celebration of the futility of motion, is a 2004 Franco-Belgian road comedy by Gustave de Kervern and Benoît Delépine. It is about two men who travel to Finland in wheelchairs to confront the manufacturer of the faulty agricultural machinery that has left them unable to walk. 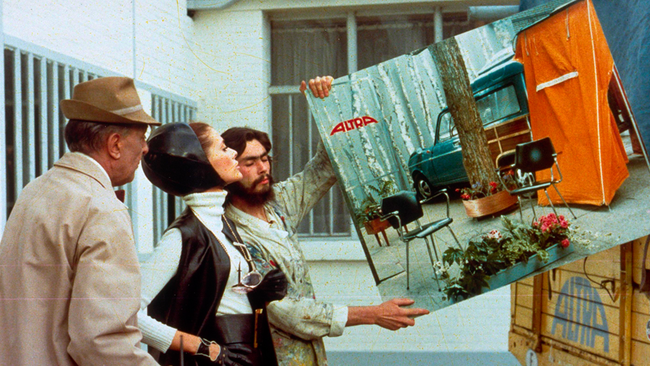 The debt to Tati could hardly be more overt: the name of the manufacturer, and of the film, is Aaltra. Jonathan Romney writes a weekly review column for Filmcomment.com. He also writes on film for the Observer, Sight & Sound, and Screen Daily and is program adviser on French cinema for the London Film Festival.